Majel Barrett-Roddenberry passed away yesterday at the age of 76. 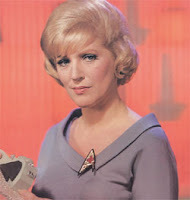 Majel (wife of Gene Roddenberry, creator of Star Trek) appeared in the Original Series as Nurse Christine Chapel and in Next Generation as Lwaxana Troi (Deanna Troi's mother) as well as providing the voice for the computer of the Enterprise. She also voiced the computer on most of the other Star Trek series (Deep Space Nine, Voyager) and was going to do the same for the new Star Trek movie (it's unclear if she had finished her recordings).